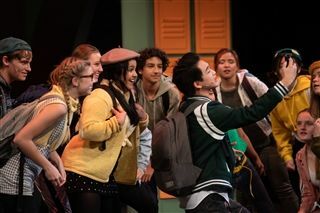 The cast and crew of Freaky Friday wowed audiences at Palomar College over the weekend! Cast members showcased their impressive acting and vocal skills while the crew kept the performance running t a toe-tapping clip. Congratulations to the entire cast and crew, including leads sophomore Ella Shreiner and senior Hannah Le Beau, director Fredreka Irvine and the surprise faculty cameos! More photos are available here.